Like many homeschoolers, I have struggled with a foreign language for my kids, especially when it comes to high school. Many, many years ago, I took German, and learned quite a bit (Danke, Herr Krueger und Frau Schmidt!) But that was, well, many many many years ago. I certainly don't know enough to teach it. I've tried to learn Spanish alongside my kids a couple of times. That hasn't been so wonderful either. The opportunity to learn (or re-learn, in my case) German with Middlebury Interactive Languages was something that really excited me. They have courses for elementary ages (3rd-5th grades), middle school, and high school. As a Crew Leader, I actually got a look at all three. My high school student has been fighting migraines, though, and I've pulled back a bit with his on-screen time. So it was mostly the other two courses that we've worked with. The focus of this review is the Middle School level. Both the Middle and High School levels of this program are set up with daily lessons, and the expectation is that you work five days a week for 18 weeks to complete one semester. Each day's work is clearly laid out, so you know at a glance exactly how far you should get in a day. I love that. You can see all the little green checkmarks showing that Thomas has completed Unit 1, Lesson 5 in the above screen shot. You can also see his saved work, though I didn't show that it was scored 6/6. Each Lesson is one day of work. So for Lesson 5 (of the first unit), there were a total of nine parts, or slides, to work through. Let's talk a bit about how this all works. The units seem to be set up in a similar way throughout. Each unit has ten lessons (or two weeks of material). Wilhelm (shown above) introduces you to the goals of the unit. 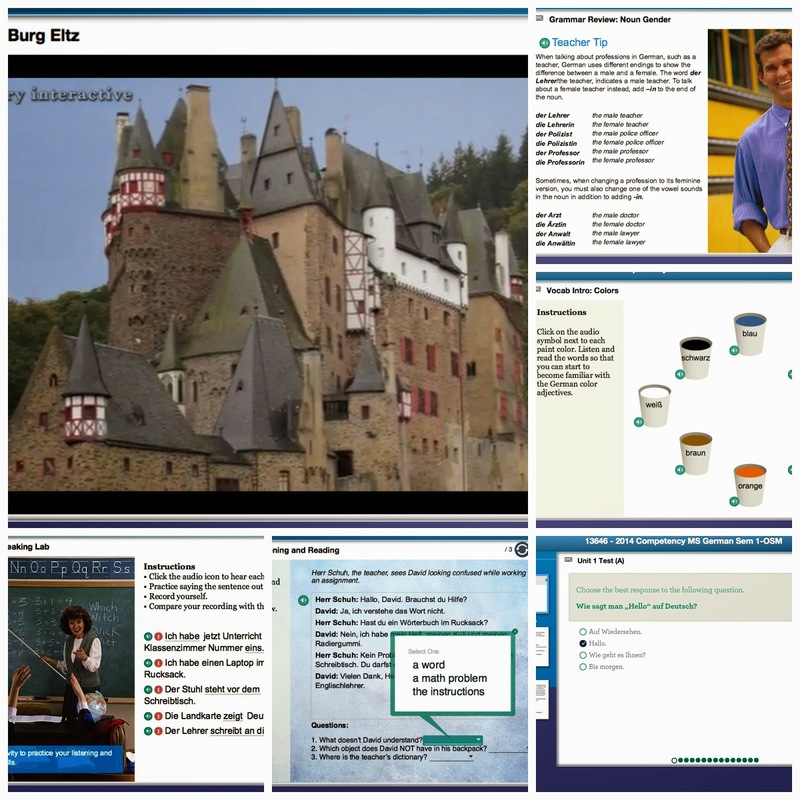 In this case, we are learning about "school" words, the alphabet, pronouns, articles, and Burg Eltz. The first thing that happens is that the vocabulary for the unit is introduced. On the left is the screen shot for that, where you can click the little speaker icons to hear the words pronounced, but there is NOTHING that tells you what the words mean. At this point (in unit one), Thomas was feeling a bit overwhelmed and like this was a bit too "immersion" without actually being immersed. I sat down to talk through some of the vocabulary with him, and I assured him it would be explicitly taught in the program too. And then I noticed the bright blue Print button. Yeah. Clicking that results in the image on the right half. A nice little list, with the German and the English. That you can should print out. I made Thomas start over from the beginning after we found that. The learning proceeds with a combination of approaches that seems to really work well. There are conversations to figure out, matching games, opportunities to select the appropriate word fill-in-the-blank style, opportunities to type in words, opportunities to record yourself speaking, direct teaching of grammar (or other) concepts, and each unit has a culture focus as well. The castle is the culture focus for Unit Two. Very cool, and it certainly grabbed the attention of my teen! The high school level is very similar, so IF William was working on it, the two of them would be learning a lot of the same materials, but the high school materials move a lot faster. It appears to work the way my Jr. High German did -- I took the first semester of high school German as a full year course in 8th grade without getting high school credit for it. Then I took the second semester of high school German in 9th grade, and got 1 credit for completing that. 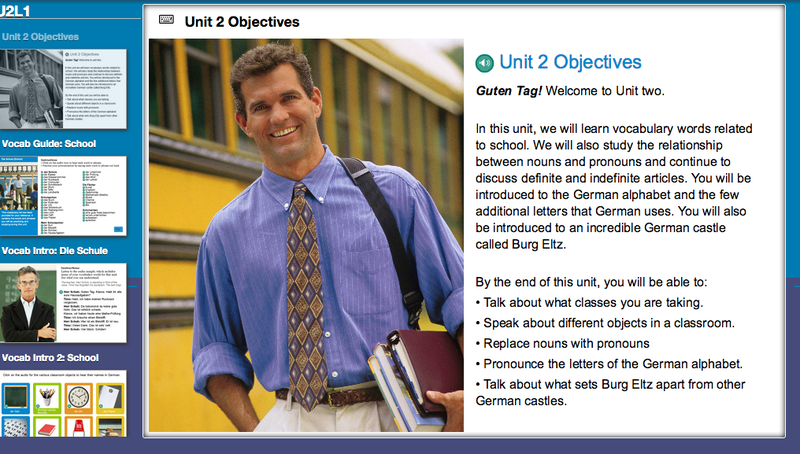 I'm pretty excited about learning German. I like that the lessons are pretty 'to the point' and not trying too hard to 'be fun.' I think the length for most of the lessons is great, although some lessons are really short. I don't like having to write German words because I have a hard enough time writing English, but I suppose it is necessary. The conversations seem fairly real, though I don't play baseball so that isn't something that comes up in my life. I was able to do things like say "See you later" or "Good morning" to my mom or other people after just a couple days, and that is nice. I like that I wasn't learning the alphabet in unit one, where it doesn't really mean much to you. Instead, that was in unit two, after you've already done a little bit of the phrases that you need to know to have a polite conversation. I got to use it right away. Because other than helping a kindergartner with schoolwork, how often does a teenager recite the alphabet? I like that they are giving you some information about Germans and Germany that is interesting and might be useful, but they don't give you a whole ton of it. One lesson out of ten on culture stuff is nice. I am really loving this program. At $119 for a semester, I think this is a great option for language learning. You do need to stay on top of it and not take big long breaks, as the course is good for six months. That's 90 days of lessons, which means you need to be doing at least 15 days worth of work each month. 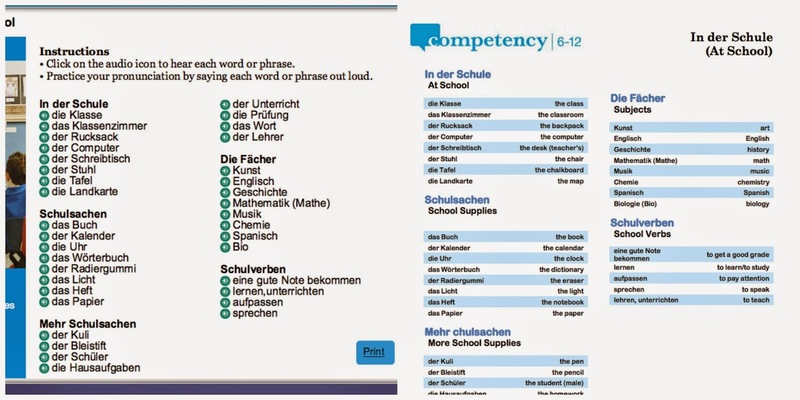 If I wasn't already reasonably familiar with German, I would have to be paying more attention to the lessons. I think a big part of why this is working for Thomas is that I am able to keep up with the conversations he is able to be holding at this point, though unit two forced me to learn some new vocabulary. We are chatting back and forth in German in itty bitty "How are you? I'm fine, and you?" segments throughout the day. I could probably pull that off in Spanish for awhile, but I'd be lost in French or Chinese. The interface from the "teacher" side of things takes some getting used to. I had to poke around a bit to find a summary of how he is doing, and we ignore the calendar completely. Having the ability to schedule days off (like when Dad took a week off work in September) would be nice. Another minor quibble is that the program is a bit touchy with marking assignments as complete. I can't seem to get it to grasp that Thomas did finish Unit 1, Lesson 5... so on the home page, it keeps telling him that is the next thing he has to do. He can still get to the correct lesson through the table of contents or the calendar, but it would be nice to be able to get there from the home page. I simply LOVE the cultural portions of the lessons. So far, we've learned about Berlin and the castle shown above, but there are lessons on other cities (Dresden), and on composers (Beethoven, Wagner), and on history (the Berlin Wall, the Berlin Airlift), and on food (pastries, pretzels), and more. The greatest part? He is clearly learning, and it is SO easy on my end. This is something I plan to continue to use. Go check other reviews, of the other languages (French, Spanish, and even Chinese!) and other ages. The elementary levels are a lot of fun!